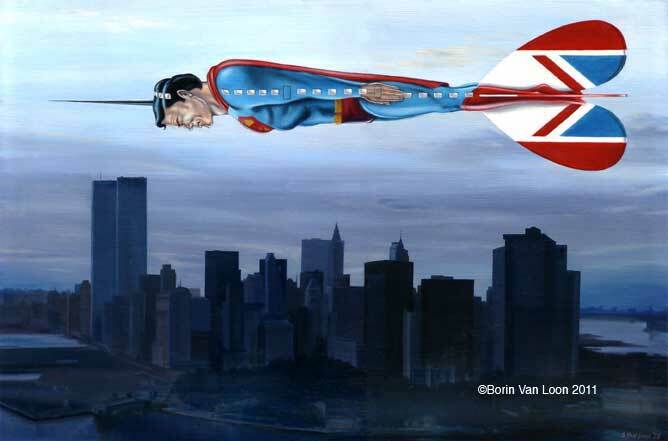 Flying at cruising speed above a twilit Manhattan Island with twin towers visible to the left (which hints that this isn't a recent painting), the composite Superman/sports dart/airliner repleat with the (then) British Airways tailplane design on the dart's flights. One art director said it would have looked better with all the Manhattan lights all on. I argued that it was supposed to suggest a somewhat more apocalyptic situation – complete balckouts on the eastern seaboard aren't completely unknown... Perhaps this depiction hints at a degree of foresight, after all. Here is Borin's original line and Letratone drawing of the idea.